Get ‘Six-Pack Abs’ and let Emsculpt do the work! Imagine losing that last bit of stubborn belly fat and getting a defined ‘six-pack’ abdomen, without hitting the gym (or breaking a sweat). Achieving the abdomen you’ve worked hard for, but couldn’t achieve without daily strenuous exercise and dieting – is now possible. Emsculpt stimulates muscles in the abdomen and flanks to simultaneously build muscle mass and reduce unwanted fat. Muscle contractions during a 30-minute session of Emsculpt are equivalent to doing 20,000 sit-ups in the gym! 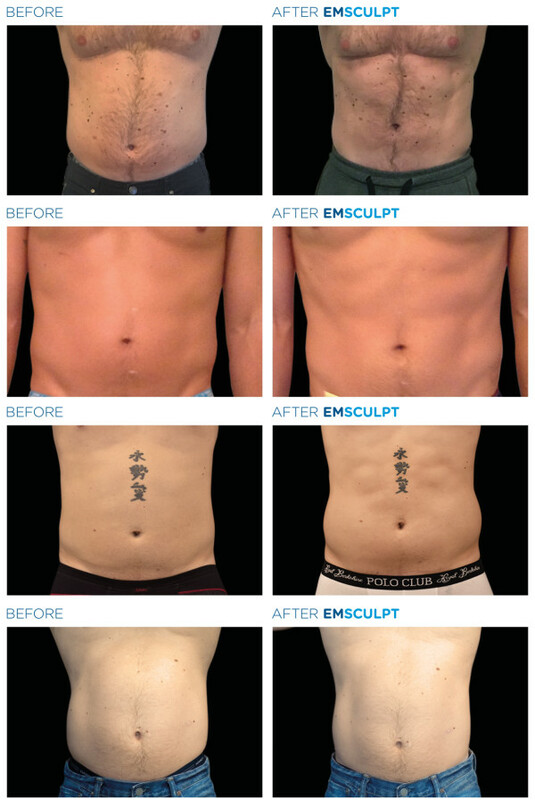 Along with up to a 21% increase in muscle tone, Emsculpt also helps burn fat in the abdomen and flanks, up to 23%. 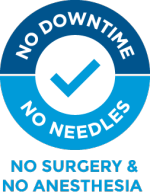 At our practice we encourage 4 treatment sessions for optimum results. Most patients can start to feel results immediately but noticeable changes are typically seen 2 to 4 weeks after the final Emsculpt session. While Emsculpt is an amazing stand-alone treatment, if there is more than 3 inches of pinchable fat covering muscle, we advise it is beneficial for patients to pair Emsculpt with Coolsculpting. Another benefit of Emsculpt is it’s ability to improve Diastasis recti. Diastasis recti occurs most commonly during pregnancy when two large vertical muscles of the abdomen separate. Most moms call this condition the stubborn ‘pregnancy pooch’. Until now, invasive surgery was the only option to bring those muscles back together. Now, Emsculpt can help improve the appearance of the belly pooch by strengthening the underlying muscles that have separated. This creates a flatter, stronger abdomen. And a cost effective and non-surgical option to treat Diastasis recti. According to clinical studies Diastasis recti can improve up to 11% with 4 Emsculpt treatments. Emsculpt before and after photographs on the female abdomen. Four Emsculpt treatments to reduce fat on the stomach, tighten and sculpt the abs, and build abdominal muscles. 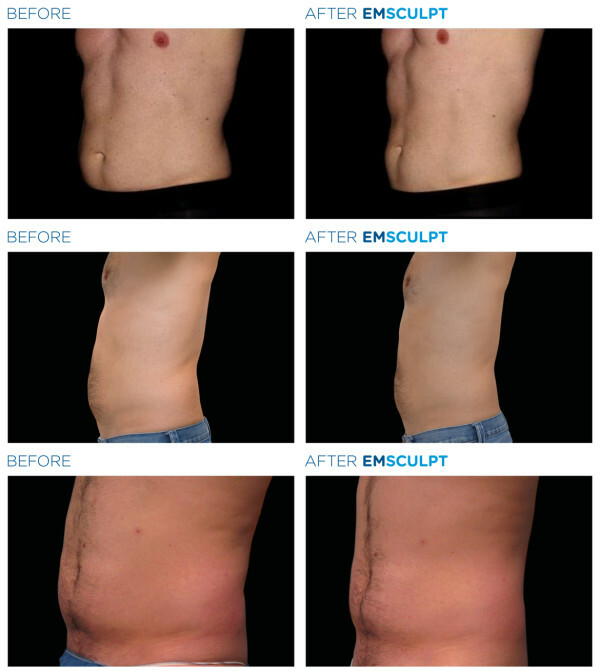 Emsculpt before and after photographs on the male abdomen. How does Emsculpt Work on the Abdomen? Watch this video to learn how Emsculpt strengthens abdominal muscles and burns stomach fat. We are a Premier Certified Emsculpt Practice, offering affordable and cost effective treatments with an upfront pricing policy. We are experienced in Emsculpt treatments on the abdomen for both women and men.